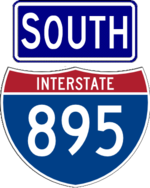 Interstate 895 runs on the Sheridan Expressway, carrying some missing movements from the Bruckner interchange. 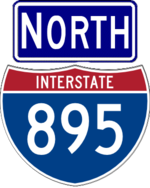 The road was once designated I-278 prior to I-278 being moved to the Bruckner Expressway; prior to that, I-695 and I-895 were also considered. I-895 was once planned to paralled I-95 in The Bronx and connect to the Bruckner Expressway. This extension was cancelled, and it is proposed to remove the expressway and rebuild the Sheridan as a surface boulevard.